This article is about the original version. For the remake, see Super Mario 64 DS. Super Mario 64[a] is a 1996 platform video game for the Nintendo 64, and the first in the Super Mario series to feature three-dimensional (3D) gameplay. As Mario, the player explores Princess Peach's castle and must rescue her from Bowser. As an early 3D platformer, Super Mario 64 is based on open-world playability, degrees of freedom through all three axes in space, and relatively large areas which are composed primarily of true 3D polygons as opposed to only two-dimensional (2D) sprites. It places an emphasis on exploration within vast worlds that require the player to complete various missions, in addition to the occasional linear obstacle courses as in traditional platform games. While doing so, it still preserves many gameplay elements and characters of earlier Mario games, and the same visual style. Producer/director and Mario creator Shigeru Miyamoto conceived a 3D Mario game during the production of Star Fox (1993). Super Mario 64's development, handled by Nintendo EAD, lasted approximately three years; one was spent on designing while the next two on direct work. The visuals were created using the Nichimen N-World toolkit, and Miyamoto aimed to include more details than earlier games. A multiplayer mode featuring Luigi as a playable character was planned but cut. Along with Pilotwings 64, Super Mario 64 was one of the launch games for Nintendo 64. Nintendo released it in Japan on June 23, 1996, and later in North America, Europe, and Australia. A remake, Super Mario 64 DS, was released for the Nintendo DS in 2004, and the original version was rereleased for Nintendo's Virtual Console service on the Wii and Wii U in 2006 and 2015, respectively. Super Mario 64 is acclaimed as one of the greatest video games of all time, and was the first game to receive a perfect score from Edge magazine. Reviewers praised its ambition, visuals, gameplay, and music, although they criticized its unreliable camera system. It is the Nintendo 64's bestseller, with more than eleven million copies sold by 2003. The game left a lasting impression on the field of 3D game design, featuring a dynamic camera system and 360-degree analog control, and established a new archetype for the 3D genre, much as Super Mario Bros. did for 2D side-scrolling platformers. Numerous developers cited Super Mario 64 as an influence on their later games. Super Mario 64 is a 3D platformer in which the player controls Mario through several courses. Each course is an enclosed world in which the player is free to wander in all directions and discover the environment without time limits. The worlds are filled with enemies that attack Mario, as well as friendly creatures that provide assistance, offer information, or ask a favor (such as peaceful pink Bob-omb Buddies). The player gathers stars in each course; some stars only appear after completing certain tasks, often hinted at by the name of the course. These challenges include defeating a boss, solving puzzles, racing an opponent, and gathering coins. As more stars are collected, more areas of the castle hub world become accessible. The player unlocks doors in the castle with keys obtained by defeating Bowser in special courses. There are many hidden mini-courses and other secrets to the game, most containing extra stars required for the full completion of the game. There are three special cap power-ups that appear in certain areas on many stages. The Wing Cap allows Mario to fly; the Metal Cap makes him immune to most damage, allows him to withstand wind, walk underwater, and be unaffected by noxious gases; and the Vanish Cap renders him partially immaterial and allows him to walk through some obstacles such as wire mesh, as well as granting invulnerability to some forms of damage. Some courses contain cannons that Mario can access by speaking to a pink Bob-omb Buddy. After entering a cannon, Mario can be shot out to reach distant places. When the player has the Wing Cap equipped, cannons can be used to reach high altitudes or fly across most levels quickly. Mario's abilities in Super Mario 64 are far more diverse than those of previous Mario games. The player can make Mario walk, run, jump, crouch, crawl, swim, climb, kick, or punch using the game controller's analog stick and buttons. Special jumps can be executed by combining a regular jump with other actions, including the double and triple jumps (jumping two and three times in a row, respectively), long jump and backflip. There are also special maneuvers, such as wall jumping - jumping from one wall to another in rapid succession to reach areas that would otherwise be too high. The player can pick up and carry certain items, an ability which is used to solve various puzzles, and swim underwater at various speeds. Mario's life energy slowly diminishes while underwater, representing how long he can hold his breath. Super Mario 64 is set in Princess Peach's Castle, which consists of three floors, a basement, a moat, and a courtyard. The area outside the castle is an introductory area in which the player can experiment with gameplay, camera and movement controls. Scattered throughout the castle are entrances to courses via secret walls and paintings. Super Mario 64 begins with a letter from Princess Peach inviting Mario to come to her castle for a cake she has baked for him. When he arrives, Mario discovers that Bowser has invaded the castle and imprisoned the princess and her servants within it using the power of the castle's 120 Power Stars. Many of the castle's paintings are portals to other worlds, in which Bowser's minions keep watch over the stars. Mario explores the castle for these portals to enter the worlds and recover the stars. He gains access to more rooms as he recovers more Power Stars, and eventually traverses three different obstacle courses, each leading to its own battle with Bowser. Defeating Bowser the first two times earns Mario a key for opening another level of the castle. After Mario defeats Bowser in the final battle, Peach is released from the stained-glass window above the castle's entrance. Peach rewards Mario by kissing him on the nose and baking the cake that she had promised him. More than five years prior to the release of Super Mario 64, producer and director Shigeru Miyamoto conceived a 3D Mario design during the development of the Super Nintendo Entertainment System (SNES) game Star Fox (1993), developed by Nintendo along with Argonaut Software. He considered using the Super FX chip to develop a SNES game which would have been called Super Mario FX, with gameplay based on "an entire world in miniature, like miniature trains". Instead, he eventually reformulated the 3D Mario idea for the Nintendo 64 - not due to the next generation console's substantially greater power, but because its controller has more buttons for gameplay. According to former Argonaut engineer Dylan Cuthbert, no game titled Super Mario FX had ever entered development, but rather "Super Mario FX" was the internal code name of the Super FX chip itself. According to Argonaut founder Jez San, Super Mario 64 was influenced by a prototype of a canceled Argonaut game starring the Mario character Yoshi, which later became the 1997 platform game Croc: Legend of the Gobbos. The full scope of Super Mario 64 spanned approximately three years, with one year spent on the design concept and approximately two years on the direct development of the game software. Development began with the characters and camera system. Miyamoto and the other designers were unsure of which direction the game should take; months were spent selecting a camera view and layout. The original concept involved the game having fixed path like an isometric-type game (similar to Super Mario RPG), before the choice was made to settle on a free-roaming 3D design. Although the majority of Super Mario 64 features the free-roaming design, elements of the original fixed path concept remain, particularly in the three Bowser encounters. One of the programmers, Giles Goddard, explained that these linear elements survived as a means to force players into Bowser's lair rather than encourage exploration. 3D graphics were created using the Nichimen N-World toolkit running on a Silicon Graphics workstation. The team placed high priority on Mario's movement, and before levels were created, they tested and refined Mario's animations on a simple grid. The first test scenario for controls and physics involved Mario interacting with a golden rabbit, named "MIPS" after the Nintendo 64's MIPS architecture processors; the rabbit was included in the final version of the game. The developers tried to implement split-screen cooperative play using Mario and Luigi simultaneously where the two characters would start at separate points in the castle and work their way through the game together. The two-player mode was eliminated because the developers were unable to make the gameplay work satisfactorily. To assist players with depth perception, the team positioned a faux shadow directly beneath each object regardless of the area's lighting. Developer Yoshiaki Koizumi described the feature as an "iron-clad necessity" which "might not be realistic, but it's much easier to play." Miyamoto's guiding design philosophy was to include more details than earlier games, using the Nintendo 64's power to feature "all the emotions of the characters". He likened the game's style to a 3D interactive cartoon. Some details were inspired by the developers' personal lives; for example, the Boos are based on assistant director Takashi Tezuka's wife, who, as Miyamoto explained, "is very quiet normally, but one day she exploded, maddened by all the time Tezuka spent at work." In the game, the Boos shrink when Mario looks at them, but when he turns away, they grow large and menacing. Super Mario 64 features more puzzles than earlier Mario games. It was developed simultaneously with The Legend of Zelda: Ocarina of Time, but as Ocarina of Time was released more than two years later, some puzzles were taken for Super Mario 64. Information about Super Mario 64 leaked in November 1995, and a playable version of the game was presented days later as part of the Nintendo 64 premiere (then known as the "Ultra 64") at Nintendo Space World. At this point, the basic controls had been implemented and the game was 50% finished, featuring 32 courses, though only about 2% of mapping was complete. Miyamoto had hoped to create more courses, but only 15 courses could fit. According to Nintendo of America chairman Howard Lincoln, Miyamoto's desire to add more to the game was a major factor in the decision to delay the Nintendo 64 release from Christmas 1995 to April 1996. Nintendo president Hiroshi Yamauchi later commented, "Game creators can finish games quickly if they compromise. But users have sharp eyes. They soon know if the games are compromised. [Shigeru Miyamoto] asked for two more months and I gave them to him unconditionally." The music was composed by veteran composer Koji Kondo, who created new interpretations of the familiar melodies from earlier games as well as entirely new material. Super Mario 64 was one of the first games in the series to feature Charles Martinet as the voice of Mario. It also features the voices of Leslie Swan (then Senior Editor of Nintendo Power) as Princess Peach, who also wrote the English text for the game. Super Mario 64 received widespread critical acclaim and is the best-selling Nintendo 64 game. At the 1999 Milia festival in Cannes, it took home a "Gold" prize for revenues above €21 million in the European Union during the previous year. By May 2003, eleven million copies had been sold. Super Mario 64 had become the second most popular game on Wii's Virtual Console by June 2007, behind Super Mario Bros. The game has been praised in the gaming press, and is still highly acclaimed. It has collected numerous awards, including various "Game of the Year" honors by members of the gaming media, as well as Nintendo's own best-selling Player's Choice selection. In addition, Super Mario 64 has been placed high on "the greatest games of all time" lists by many reviewers, including IGN, Game Informer, Edge, Yahoo! Games, and Nintendo Power. Electronic Gaming Monthly awarded the game a Gold award in its initial review, and in Edge magazine, Super Mario 64 was the first game to receive a perfect score. At the 1997 Computer Game Developers Conference, it was given Spotlight Awards for Best Use of Innovative Technology, Best Console Game, and Best Game of 1996. It won Electronic Gaming Monthly's Game of the Year for both editors' pick and readers' pick, as well as Nintendo 64 Game of the Year, Adventure Game of the Year, and Best Graphics. British magazine Maximum gave it their "Maximum Game of the Month Award", making it the only import game (since Super Mario 64 had not yet been released outside Japan) to win that honor, and attested it to be the greatest game the magazine had ever reviewed. Game Informer initially rated the game a 9.75, but re-rated it a 9.0 a decade later in a "Retro Review". The Japanese gaming magazine Famitsu rated Super Mario 64 a 39/40. GamePro gave it a perfect 5 out of 5 in every category (FunFactor, control, sound, and graphics). Common praise focused on the presentation, while criticism was directed at the camera system. Nintendo Power lauded the graphics, sound, and gameplay, but commented the shifting camera angle took getting used to. Next Generation Magazine praised many aspects of the game: musical score, graphics, lack of loading times, and the scale of the game, though they commented that the game is less accessible than previous Mario games, citing the camera's occasional, erratic movements and lack of optimal angle as frustrating. GamePro particularly praised the combination of unprecedented technical performance and captivating artistic design, calling it "the most visually impressive game of all time." Maximum found the game's strongest points to be its sense of freedom and the fact that revisiting levels unearths new areas and challenges. Video game publications and developers praised Super Mario 64 for its design and use of the 3D gameplay. The game is counted by 1UP.com as one of the first games to have brought a series of 2D games into full 3D. Maximum commented that "The old 2D platform genre is essentially dead with the arrival of this game. The limitations inherent with the genre have been swept away in the wake of Mario 64." In the transition to 3D, many of the series conventions were rethought drastically, placing an emphasis on exploration over traditional platform jumping, or "hop and bop" action. While its quality was disputed by some, it has been argued that it established an entirely new genre, different from that of previous games in the series. Time Magazine focused on the realistic kinetic animation and the controls provided by the integration of the new pressure-sensitive controller into the game, calling it the "fastest, smoothest game action yet attainable via joystick at the service of equally virtuoso motion", where "[f]or once, the movement on the screen feels real". In the same issue in which they reviewed the game, Next Generation ranked it number 1 on their "Top 100 Games of All Time". They explained, "Super Mario 64 is the first true 3D game to play as good as the 2D games of the 16-bit era. ... As such, it represents the new high-water mark of both gameplay and graphic sophistication." GameSpot called it one of the 15 most influential games of all time, and rated the Nintendo 64 version a score of 9.4 and the Wii Virtual Console version an 8. Game Informer commented that even a decade later the game still offers hours of entertainment. They also commented on the camera system, stating that by present-day standards the camera system "would almost be considered broken". Game Revolution's retrospective review referred to the graphics as "beautiful", but criticized the camera angles, saying "it doesn't work as well as it should". The game placed 6th in Official Nintendo Magazine's "100 greatest Nintendo games of all time". In 2009, Game Informer put Super Mario 64 13th on their list of "The Top 200 Games of All Time". Official Nintendo Magazine referred to the game as a "masterpiece of game design", stating that Nintendo was able to take its "number-one 2D franchise and convert it flawlessly into 3D". Michael Grayford of Liquid Entertainment stated he was initially "very turned off" by the openness of the game the first time he played it. Upon playing it later, he was "highly pleased" and stated "each level brought some new unique cool gameplay element and I was never bored". Warren Spector, former lead designer at Ion Storm, stated it was "not possible to squeeze this much gameplay into a single game" and "no game has done a better job of showing goals before they can be attained, allowing players to make a plan and execute on it". He also praised the exploration aspect of the game, commenting that "[allowing players to] explore the same spaces several times while revealing something new each time is a revelation". 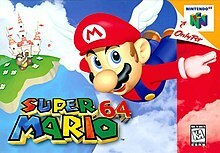 Critics acknowledge Super Mario 64 as a key contributor to the anticipation, and initial success, of the Nintendo 64 console. Though the system was initially very successful, it eventually lost much of its market share to Sony's PlayStation. 1UP.com attributed this decline to Nintendo's use of cartridges and the design of the Nintendo 64 controller, which were reportedly implemented by Miyamoto for Super Mario 64. The game also set many precedents for 3D platformers to follow. GameDaily listed the game as one of the "Most Influential Video Games" and stated it "defined the 3-D platform experience, influencing numerous designers to create their own, original offerings". GamesTM noted many game companies, including Nintendo, have tried to develop a platform game to match up to Super Mario 64. Members of Rare, a second-party developer for Nintendo during the 1990s, reflected in 2013 that during the development of 2001's Conker's Bad Fur Day, they had originally drawn inspiration from their deep analysis of the gameplay and camera mechanics of Super Mario 64: "We were just copying Mario, weren't we? Which, to this day, is still the best 3D camera. ":8:10 Super Mario 64 is notable for its sense of freedom and non-linearity. A central hub, where controls can be learned before entering levels themselves, has been used in many 3D platformers since. In addition, the game's mission-based level design is an inspiration for other game designers. Martin Hollis, who produced and directed Rare's GoldenEye 007, says "the idea for the huge variety of missions within a level came from Super Mario 64". In 2012, Dan Houser, a prominent figure in the development of the Grand Theft Auto series, stated, "Anyone who makes 3D games who says they've not borrowed something from Mario or Zelda [on the Nintendo 64] is lying." Tetsuya Nomura, a leading designer at Square Enix, stated in 2016 that Super Mario 64 was the impetus for the creation of the Kingdom Hearts series. Super Mario 64 is the first game to have a "free" camera that can be controlled independently of the character. Most 3D games from the time use a first-person perspective, or a camera that is fixed in position relative to the player's character, or to the level. To create freedom of exploration, and more fluid control in a 3D world, the designers created a dynamic system in which the video camera is operated by the in-game character Lakitu. The camera system would become the standard for 3D platform games in the future. Nintendo Power stated the camera-control scheme is what transitioned platform games into three dimensions, and that the game, along with The Legend of Zelda: Ocarina of Time, "blazed trails" into the 3D era. Along with camera control, the game also innovated in its implementation of movement. Edge stated the game changed "gamers' expectations of 3D movement forever". The Nintendo 64's analog stick allows for more precise and wide-ranging character movements than the digital D-pads of other consoles, and Super Mario 64 uses this in a way that was unique for its time. At the time, 3D games generally allowed for controls in which the player could either control the character in relation to a fixed camera angle or in relation to the character's perspective. Super Mario 64's controls are fully analog, and interpret a 360-degree range of motion into navigation through a 3D space relative to the camera. The analog stick also allows for precise control over subtleties such as the speed at which Mario runs. Super Mario 64 was one of the first games to implement the system. Because of the game's popularity, rumors about glitches and secrets spread rapidly after its release. A common rumor was that Luigi was a secret character in the game, fueled by illegible symbols in the castle courtyard that were said to resemble the text "L is real 2401". This same texture would reappear in The Legend of Zelda: Ocarina of Time on a plaque in Dodongo's Cavern. IGN received so many questions and supposed methods to unlock Luigi that the staff offered a US$100 reward to anyone who could prove that Luigi was in the game. The number of false codes submitted to IGN dropped dramatically, as Luigi's inclusion was proved to be a myth. The April Fools' Day 1998 issue of Nintendo Power claims that the cryptic phrase would be discussed on the non-existent page 128, and also features a facetious article, "Luigi 64", commenting humorously on the rumor. Several players have discovered coins that were impossible to obtain without glitching the game. Scott Buchanan, under the alias pannenkoek2012, had managed to collect one of those coins in 2014 without tool-assistance, and also creates content about the programming mechanics of Super Mario 64. On May 5, 2011, Super Mario 64 was selected as one of the 80 games to be displayed at the Smithsonian American Art Museum as part of "The Art of Video Games" exhibit that opened on March 16, 2012. A 64DD version of the original game was created only for demonstration of the prototype drive's operation and performance at the 1996 Nintendo Space World trade show. Nintendo of America's Chairman Howard Lincoln explained, "Super Mario 64 is running on the 64DD right now. First they weren't going to show anything on 64DD, but they decided at the last minute to have a game people recognize." Like Wave Race 64, Super Mario 64 was re-released in Japan on July 18, 1997, as Super Mario 64 Shindō Pak Taiō Version (スーパーマリオ64 振動パック対応バージョン, Sūpā Mario Roku-jū Yon Shindō Pakku Taiō Bājon). This version adds support for Nintendo's Rumble Pak peripheral and includes the voice acting from the English version. In 1998, Super Mario 64 was re-released in Europe and North America as part of the Player's Choice line, a selection of games with high sales sold for a reduced price. The game was later released on the Wii's Virtual Console service in the United States on November 19, 2006, and in other territories the following weeks. This release adds compatibility with the GameCube and Classic controllers, and enhances the resolution to 480p. An enhanced remake for the Nintendo DS called Super Mario 64 DS was available for the launch of the handheld system in 2004. Yoshi, Luigi, and Wario are additional playable characters, and the game features improved graphics, slightly altered courses, touchscreen mini-games, and a multiplayer mode. In addition, the number of Power Stars has been raised from 120 to 150. Reviews were mostly positive, and by March 2008, 6.12 million copies of Super Mario 64 DS had been sold worldwide. In 2015, a fan remake of Super Mario 64 was created in Unity, called Super Mario 64 HD. The project was later taken down due to a copyright claim by Nintendo. A direct sequel tentatively titled Super Mario 64 2 was planned for the Nintendo 64DD. In July 1996 Nintendo insiders stated that Miyamoto was assembling a team to work on a Super Mario 64 sequel, consisting mostly of developers who had worked on the original Super Mario 64. Miyamoto mentioned at E3's 1997 convention that he was "just getting started" on the project. In May 1999, Super Mario 64 2 was reported to be released in late 1999; however, the game was canceled due to the commercial failure of the 64DD, as well as lack of progress in the game's development. Instead, Super Mario 64 was followed by other 3D Mario games on subsequent Nintendo systems, such as Super Mario Sunshine for the GameCube and Super Mario Galaxy for the Wii. These games built on Super Mario 64's core design of enhancement items and open ended gameplay. Super Mario Galaxy 2 features a remake of Mario 64's Whomp's Fortress level. Later 3D games, namely Super Mario 3D Land and Super Mario 3D World, while keeping many of Super Mario 64's core gameplay elements, departed from the game's open-ended design and focused more on platforming reminiscent of 2D games. The Nintendo Switch game Super Mario Odyssey returns to Super Mario 64's open design. This page is based on the Wikipedia article Super Mario 64; it is used under the Creative Commons Attribution-ShareAlike 3.0 Unported License (CC-BY-SA). You may redistribute it, verbatim or modified, providing that you comply with the terms of the CC-BY-SA.